Hi! In this blog post I am going to be doing a review on a website called freerice.com. To start, Free Rice is a site that asks you questions, on various subjects, which donates rice to the United Nations World Food Programme for each question answered correctly. In third grade, my teacher showed our class this website, and we would answer the questions on the smart board. The subjects that your questions can be on are, humanities, English, math, chemistry, language, geography, science, and test prep. You can see people's scores, and look at the top scores, and totals of how much rice there was donated in different time periods. Looking at one of the pages where it shows you how much rice was donated, it says it was started back in 2007. 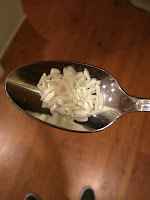 I don’t know my highest amount of rice donated, but one of my recent scores was around 600 grains of rice. Even though that might sound like a lot, look at this picture of one hundred grains of rice, you might change your mind. I enjoy going on this website and answering questions to donate rice, because I know it is all going to a good cause. I like answering the questions, because if you get a certain amount of questions answered correctly, you go up one level, and the levels get harder as they go up, and I find that motivating. In conclusion, I recommend this site to anyone who wants to learn about different subjects, and do something good for the world at the same time. Hi everybody, I apologize that I haven't posted for my summer journal in a while, so I'm going to try to get that done soon. Read on! So this is a post about one of my favorite games to play on the computer. That game is called Animal Jam. Me and my friends play it together. The cool thing about it is that it's made by National Geographic!! In this game, you have an animal avatar. When you create your account, the only animals that come up are the tiger, the wolf, a panda, a bunny, a seal, the koala, the penguin, and a monkey. For now, you can only get those animals because 1) you are not a member yet, and 2) they are the basic animals and you can always get different animals once you have completed the tutorial and have enough gems. Then you pick a name. Your name can't be anything, and they have a selection of words that you can put together to be you name. There are three columns, and there are word in each column. the first column has adjectives, nouns, and verbs. For instance, a couple of the adjectives to choose from are happy, glam, and major. Some of the nouns to choose from are snowflake, leader, and miss. And, some of the verbs are dancing, jumping, and pouncing. That is the first word. The second word and the third word come together and make one word. (Word, word, word.) Like the first column, there are adjectives, verbs, and nouns in the second and third column. My fox's name on Animal Jam is Miss Spiritfox. After the tutorial you receive 2,500 gems, the currency in the game. Now you have enough to buy another animal with 1,500 gems left over! You have a den, which is you house. You can buy house decorations and furniture from right there! Like on most virtual games, you have a buddy list. On your buddy list, there is all of your buddies, and at the bottom it says _/100. The first number is how many buddies you have. You can have up to 100 buddies. once you buddy someone and you have under 5 buddy slots left, it will say "you now have _ slots left". Add me as a buddy! My username is loldude345. There are different places that you can go in Jamaa, which is the world of Aninal Jam. I'll cover that and more in my next post! That was part one for this post, because I am going to do a part two about the rest I have to say about Animal Jam. Today was my second day in camp at The Center For Contemporary Art. In our first class, we started making peacocks. Next we will color them in with watercolor paints. In ceramics (our second class), we made mugs out of clay. And in our last class, we finished working on prints. When it was time to leave, me, my mom, and my brothers went to Kings to have lunch and pick up a few things. I had sushi for lunch, along with my brother, and my other brother had soup. When we got home I read for a little while, I finished my book, and started a new one. Then I went on the computer and did a little online shopping on Justice because I had a gift card. Then when dinner was done, (my oldest brother Jeremy made dinner as a special treat), I went up to shower. Then me, my mom, and my brother watched two things on TV. When they were done, it was late. I brushed mt teeth and got into bed. Thank you for reading! Sorry I couldn't do yesterday's and the day before's post. I might not get to do a post everyday, but most days I will. When I woke up this morning it was 7:30, and I decided that I would take another 30 minutes to stay in bed. When I got up my brother was down there. My other brother and his friend who slept over were still in bed though. When my dad and mom came down, we had eggs for breakfast. I had toast and ketchup with my eggs. At 11:00 my dad had to leave for Philadelphia. After that, my friend Luca invited my brother and me over for lunch. We had a little bit of time before lunch, so we played in that time. We had pulled pork sandwiches for lunch, then Summer, her friend Brook, Kyle, and his friend Brendon came over. We did stuff upstairs, then we just chatted. Then all of the boys went out to play IN THE RAIN. All of the girls stayed inside. When the boys came back, they were soaked. They went upstairs to dry while their clothes dried. Me, Brook, Summer, and Micol played Monopoly. Then my parents came and the kids had cadbunada for dinner. After that, everyone went out to play while it was raining. Me and Brook stayed inside. When we went out, everyone was playing at the park. we joined in, but when we came back we were wet. Everyone had a jacket on, so their top was dry, but they were still wet. Me and my brother each dried off, had a cookie and then went home. After me and my brothers finished showering, I started working on this blog post. And now I'm finishing it. Sorry I didn't do June 25 and June 24. I didn't have a chance to do them. Today I went to the pool again. This time when I was getting ready my friend Amanda called me and asked if I wanted to come to the pool with her and I said that I already had plans to go to the pool. Turns out we were planning on going at the same time! When we got to the pool, Amanda wasn't there yet, so I tested the water to see how it felt. It felt good, so I got right in. Soon after, Amanda got there. She jumped in right away, of course. We splashed and splashed for a long time. Then my neighbor Elizabeth came and we all played together. When adult swim came, we tried to have fun on the steps, which is not easy because you have so little room. We knew that after 15 minutes was over, adult swim would be over too. But how can we tell if there is no clock? The lifeguards switch right before adult swim is up. Then they blow their whistle. Me, Amanda, and Elizabeth had our eyes on the lifeguards the whole time. When they got ready to switch, we got ready to jump back in the pool. 3... 2... 1... TWEEET!! Everyone got back in the pool. Me, Amanda, and Elizabeth then did some jumping into the pool. After that, we had a water fight. that was super fun. Then one of my other neighbors came. Her name was Ella. She joined us in our water fight, then we did "exersises" on the wall on the pool. After one more adult swim, It was time for meto go home. By then, it was almost 5:00! We came home, and after that my dad came home. We had dinner, I showered, then it was time for me to go to sleep. Sorry I couldn't post this yesterday I didn't have time. Today I was planning on going to the pool, but when I saw the weather report, that was out of the question. We were supposed to get thunderstorms, rain, and heavy wind! So I called my friend Claire, and we had a play date. While Claire was over, my uncles came over with their dog Athena, (a German Shepherd), and Iggy, (a Toy Poodle). 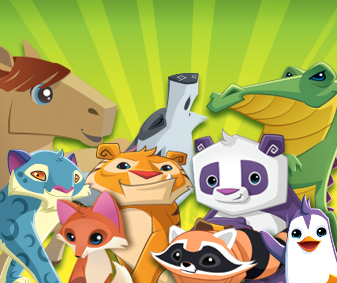 Me and Claire played this awesome game Animal Jam, (post coming soon! ), and then we played Webkinz. After that, we played with Iggy. Then the storms came. There was a lot of thunder, but it wasn't too loud. Then it rained for a little while. It stopped raining while me and Claire were having dinner, and there was a tiny bit of thunder. Then Claire's mom came and it was time for her to go. I finished up my dinner, but I didn't need to shower because I was in my PJ's the whole day! So I just hung out for a while, then went to work on this post. Now it is like 8:30. Goodnight! Today I went to the local pool. I called my friend to see if she could come too. Turns out she had already been planning on going also! When we got there I saw that some of my other friends were there too. I knew that I would have an awesome time. Anna, the girl I called, was there as promised, as well as my friend Aylilah. It didn't take me long to get in the pool - it was just the right temperature! Soon after I got in, some of my neighbors came to play!! They jumped right in. We played Marco Polo for a while, then we just swam and splashed around. But then - oh no!! It was adult swim!! Those 15 minutes just kept dragging on, and on, until finally - TWEEEET!!! "YAY!!" It seemed like a million kids jumped in the pool at the same time! We all got back in then did some "exercises". It was really just jumping in, doing flips and stuff like that. After a long while, adult swim YET AGAIN! I went up to the snack bar and got an ice cream sandwich in the meantime. After a long, long, yet SUPER fun time at the pool, it was time to go. It was almost 5 o'clock by the time I got home! I took a shower, then at about 7:30 we had dinner. And now, I'm writing my post. It is like 9:30 now. Goodnight!